Ian Rowley; who are you, what are you paying for, and where should I send it???? I know Ian but sadly don't know his number. I can however get a message to him I'm sure. All items are used parts and untested unless stated otherwise. Last edited by xvivalve on Tue Oct 16, 2018 5:25 pm, edited 5 times in total. Last edited by xvivalve on Sat Sep 29, 2018 9:14 pm, edited 2 times in total. Last edited by xvivalve on Tue Aug 21, 2018 6:56 pm, edited 2 times in total. 217: An offside rear door in saffron from a 1972 car. This, whilst not perfect, is one of the best offside rear doors I've seen available in recent years. Strictly collection only on this; it's currently still in Hampton, but could be transported to Fleet, Wokingham or Stourbridge for collection. If collecting from Hampton, it will be by prior arrangement on a Saturday when I'm planning to be there. I'm putting a reserve of £60 on this due to its rarity and condition. 218: A nearside rear door, allegedly from the same 1972 car, but the colour is somewhere between Inca and Mimosa! This door is also in good condition and still has the factory protective plastic sheet on the inside. Strictly collection only on this; it's currently still in Hampton, but could be transported to Fleet, Wokingham or Stourbridge for collection. If collecting from Hampton, it will be by prior arrangement on a Saturday when I'm planning to be there. I'm putting a reasonable reserve of £40 on this due to its condition. Last edited by xvivalve on Thu Oct 04, 2018 7:50 pm, edited 1 time in total. If anyone wishes to make a meaningful offer on it, I'll give such offer consideration whilst there are no bids on it. Bidding on these items will end at 6 pm on Sunday 07 October. 261. 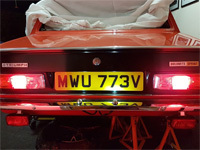 A pair of early internal trim panels to the A-post/footwell area, along with a single nearside version of the nearside equivalent to later cars. The hardboard from the later one may render its inner hardboard panel to repair the offside early one which is compromised (and photographed twice from both sides). All three are listed as a single lot. 269. A pair of Sprint engine mounts complete with engine brackets; both seem serviceable, but one is better than the other. 276. 1850 overdrive gearbox rear bracket. Mount not included. Last edited by xvivalve on Sun Nov 04, 2018 7:20 pm, edited 5 times in total. 280: Two OE sump gaskets for the 1500 (AJM517) These are good thick gaskets with asbestos. Sold as a pair as postage will be disproportionate for just the one! Last edited by xvivalve on Sun Nov 11, 2018 12:56 am, edited 1 time in total. I'm now heading to Cardiff tomorrow slightly earlier than planned so I can be there in time to watch England v All Blacks, which is being screened before the big match, so any last minute bids won't be seen by me, nor the final bids updated, until my return late evening.